​No matter how great your tennis racquets are, their strings are bound to lose tension and stretch as you play with them. So, you need the best tennis stringing machine to always be ahead of your game while also saving a lot of time, money, and effort in the long run. 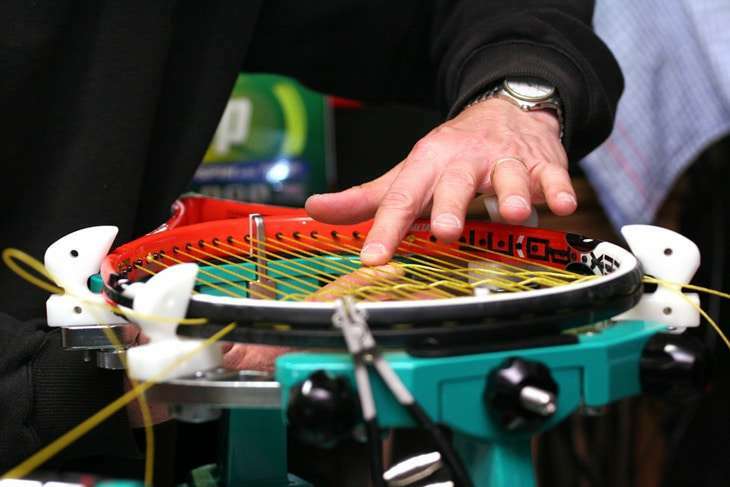 In this article, we will go through five amazing tennis stringing machines, a buying guide, and everything else you need to know in choosing the best stringing machine. So what are you waiting for? Scroll down to find out more! 1. Standalone Or Table Top? 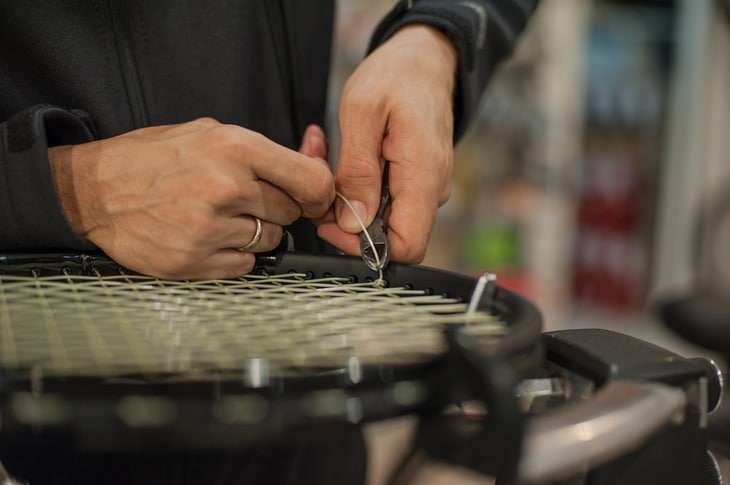 ​Before making a purchase of a tennis stringing machine, there are several considerations and important decisions that you have to make first. This will make it easier for you to find what suits your needs best and what will make the most value out of your hard-earned money. There are two main types of stringing machines: standalones and table toppers. Your choice will depend on whether or not you plan to transport your machine around or if your want to have it fixed somewhere. Table top stringing machines are your best option if you want something that is affordable, portable, and easy to move around. They offer convenience since they can be mounted on any stable surface such as a desk or table. These are great for taking to tournaments or clients. Standalone stringing machines, on the other hand, are sturdy and stable on their own, often with wide and heavy bases. These allow you to string a little faster and are more comfortable to work with, even while standing. Standalones are more expensive since they often come with advanced features and are recommended for the pros. Stringing machines often come with either of the three tension setting processes: manual, drop weight, and electronic. Each of these differ in structure, cost, and the level of physical effort you need to exert to set the string tension accurately. Manual Machines or crank machines are cheap and accurate although they require the most physical effort than any other type of machine. These are also known as spring head or lockout machines. To achieve the right tension, manual machines use a special crank with a pre-loaded spring. After specifying the tension, a locking or brake mechanism activates to maintain the string tension. The string is then clamped, the lock disengaged, and the process moves on to put tension on the next string. Manual stringing machines offer higher tension accuracy than drop weight machines. 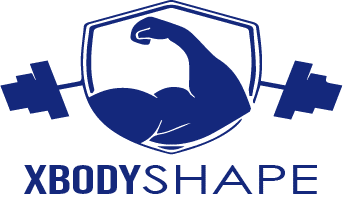 ​​Drop weight machines are also relatively affordable and easy to use. These require a little less effort than manual machines but this makes their operation slower. These models use a rod for measuring the string tension while a moveable weight on one end allows you to adjust the tensions in a scale. A higher string tension is achieved by moving the weight farther outward while moving it inward results to a lower string tension. After reaching you desired string tension on the first string, it is then clamped off and the process must be repeated for the next string. These are probably the slowest way to string racquets and are limited in terms of tension accuracy. However, these are the most basic, common and popular since they require very little maintenance and are relatively cheaper. ​Electronic machines are the most expensive but due to good reason: they are accurate, they require almost no physical effort, and they work faster. You simply have to set your racquet down and push a button! Electronic stringing machine models utilize a microprocessor or a computer-directed motor to measure and adjust the tension of the string. They can either come in a lockout of constant pull version. Lockout electronic stringing machines work exactly as a manual crank would. The string is pulled against a preloaded reference string until the desired tension is reached. However, an electric motor does the cranking for you. Also, these do not measure the string tension throughout the stringing process so you really have to repeat all the steps for each new string. Constant pull electronic stringing machine models monitor the string tension all throughout the stringing process and can adjust the tension accordingly in case there are any changes. These are the fastest and most accurate tennis stringing machines although they do come with the most hefty price tags. Most tennis stringing machines come with either a 2-point, 4-point, or 6-point mounting system. These numbers essentially refer to the number of contact points between the machine and the racquet’s frame in order to secure it firmly in place during the stringing process. Machines with 2-point mounting systems often hold the frame at the head and throat, which makes the process more convenient and much faster. These are also the least expensive. However, this makes the frame more prone to shape distortion or twisting due to the less amount of support given. This is especially a huge problem for oversized racquets because it puts a lot of stress on the racquet frame. Most basic models feature a 2-point mounting system but a 4-point or 6-point mounting system will offer more stability and security although these slightly prolong the stringing process. Adjustable mounts and rubber or plastic surfaces that protect the frame’s finish are some extra features you should also look for. 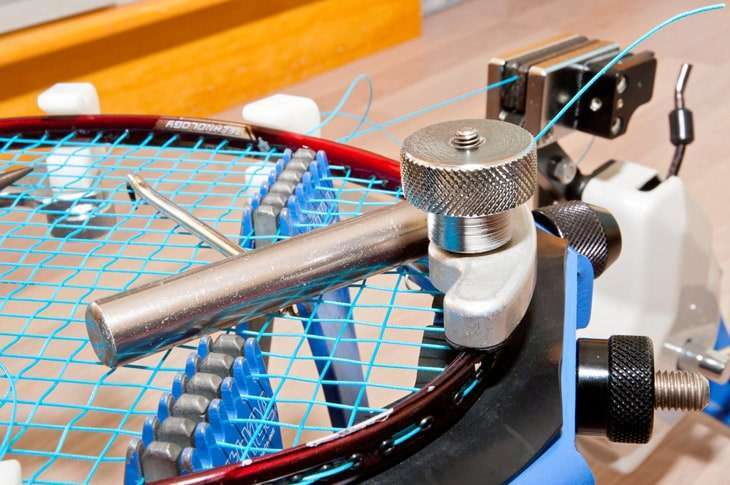 If you play a lot and end up stringing a few racquets per week, you will realize why you need to consider how easy and convenient it is to use a stringing machine. This is especially true for manual and drop weight machines that require you to lift the lever or crank for every string, which is of course, physically exhausting. Therefore, I suggest that you look for drop weight machines that feature a one pull action mechanism. Or better yet, opt for electronic models for faster and easier stringing every time. You can also look for features that will make the process easier for you, like an accessible tool tray, handles, reliable clamps, and such. This type of clamps use the tension of one string to hold the tension of another. They are not in any way attached to the machine, hence the term “floating” or “flying”. They usually come with basic tennis stringing machines. They are cheaper than fixed clamps but they do not provide the same level of tension consistency and accuracy. Fixed clamps offer better tension consistency than floating clamps although they are only typically found in units that fall within the average to high price points. Fixed clamps can further be divided into two types: swivel and no swivel fixed clamps. ​Fixed clamps with no swivel simply glide along a bar system located under the racquet. This maintains the consistency of the string tension. No swivel fixed clamps can be adjusted and repositioned as you change from mains to crosses. Their range of motion is limited from 0° to 90°. ​Fixed clamps that swivel, on the other hand, also glide through a bar system similar to no swivel clamps. However, unlike the no swivel type, swivel fixed clamps have a more flexible range of motion and can rotate by 360 degrees. This allows you to create fun patterns. These are also the easiest to use. Unfortunately, swivel fixed clamps often only come with deluxe tennis stringing machines designed for the pros, which are of course, the most expensive types. The best tennis stringing machine will also have a good racquet support system that will protect your racquet from any type of breakage, deformation, or damage during the stringing process. The stress on the frame and the racquet itself should be kept at a minimum. Otherwise, cracks may form and the durability and performance of the racquet will be affected negatively. This might even lead to breakage during your game! To find a good racquet support system, make sure the support mechanism is as wide as possible. Direct support is superior over indirect support since the former never causes any cracking. You should also consider the frequency and quality of stringing performance that you need in a stringing machine. 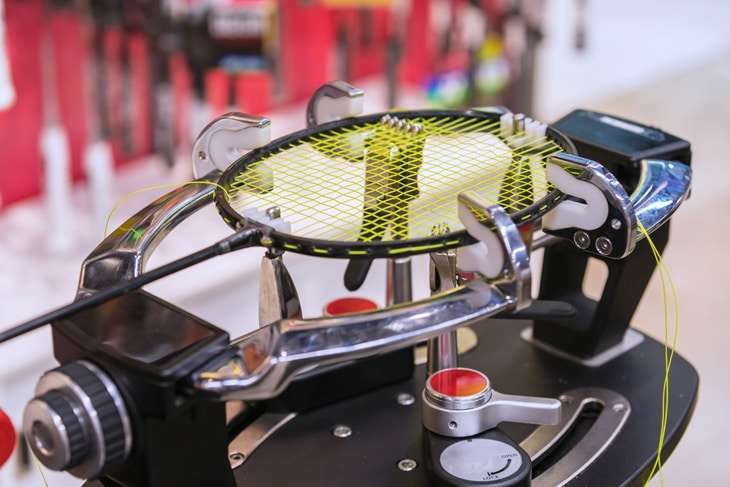 You might be planning or anticipating to use a machine for stringing your personal racquets in which case you can live with a lower-priced machine with less features. Otherwise, if you are a pro and are stringing multiple racquets each week for yourself or for others, you want to invest on a more costly machine with more features. This will ultimately save you a lot of time, money, and effort in the long run. As with any other purchase, you should always consider a product’s price. First, decide on your budget limit or how much you are willing to spend for a stringing machine. If you will just be using a machine for infrequent personal use, it does not make sense to spend a lot of money on it either. If a stringing machine will be an important aspect in your business or career, then by all means spend a little more on a professional machine with more and better features. These are also the once that you can customize. So, the price does not only depend on your budget but also on the type of service and performance you require from a machine. Take note that tennis stringing machines come in a wide range of prices from a couple hundred dollars up to a few thousand dollars. Since a tennis stringing machine is also an investment, always look for good warranty in case anything goes wrong. Contact the distributor or manufacturer regarding the warranties that they offer in case something is gets missing, dysfunctional, or broken. Consider the nature of the warranty as well. Is it just for repairs or replacements? Do they offer a money back guarantee? Does this include the shipping costs? What is the turnaround time and how long is the warranty valid? Good companies will put their customer’s peace of mind and satisfaction as their priority and will often offer long, reasonable warranties for their products. So, it is important to be familiar with their type of customer service and warranty offers as a way to gauge the quality of the product you will be buying. Let’s take a look at the best tennis stringing machine options you have available in the market today! First on our list is the Klippermate Stringing machine which claims to be America’s best selling and most accurate racquet stringer for the past three decades. The Klippermate Stringing machine uses a drop weight tensioning system that stays calibrated according to the industry standard plus or minus one pound. You won’t be needing a ratchet pulling system or clutch thanks to the exclusive Cam String Gripper which also reduces the average stringing time to approximately thirty minutes or less. While other models have flimsy plastic composite clamps, this stringing machine comes with durable steel string clamps covered with a lifetime guarantee. A sturdy two-point mounting system also helps prevent and avoid any damages to your racquet. It supports all racquet sizes as well. The base of the Klippermate stringing machine is made of heavy steel for better stability rather than lightweight materials like plastic or aluminum. This feature lets you string anywhere because you won’t need to clamp or bolt the stringer down anymore. This USA-made stringing machine even offers a 30-day money back guarantee and an unlimited lifetime guarantee. Restring your racquets with professional precision and accuracy with the Gamma Sports X-Stringer Stringing machine! This machine is constructed with either a 6-point Quick Mount System or a two-point racquet mount to keep your racquet steady in place as you work. You can use it to string racquetball, badminton, squash, or tennis racquets with any kind of string. The drop weight tensioning mechanism of the Gamma XS accommodates 9 lbs to 90 lbs or 4-41 kgs. Its turntable is made with nickel chrome plated steel bar and rotates 360° to make everything easier and faster. This machine also features a durable design which features a sturdy yet lightweight aluminum extrusion base complete with an anodized finish, a built-in drawer and tray for your tools, and a rotating ratchet gripper with diamond dust coated surfaces for added durability and reliable grip. Universal string clamps provide just the right amount of clamping pressure for tennis racquets thanks to the unique self-locking adjustment knob. The spacing between the teeth was also optimized for these racquets. This unit even comes with a convenient tool set composed of a cutter, straight pliers, hex wrenches, a straight awl, and a pathfinder awl. It also comes with three Gamma tennis string sets and a stringing guide from the United States Racquet Stringers Association. For your peace of mind, the Gamma X-Stringer is backed by a 1-year warranty on string gripping and electronic components as well as a 5-year limited warranty. Equipped with electronically controlled pull tensioner, the Gamma Progression Tennis Racquet Stringing machine provides the perfect, accurate string tension for your racquet from 9 to 90 pounds. Thanks to the 2 to 6-point mounting system, you can safely and easily secure your racquet in place for stringing. The machine is compatible for use with badminton, squash, racquetball, and tennis racquets. Aside from all its amazing features, this unit also comes with a built-in tool tray and a tool set consisting of a diagonal cutter, hex wrenches, straight awl, pathfinder awl, and pliers. The Gamma Progression is a table top stringer that is built to last for years. The broad base design provides stability while the diamond-coated rotationat ratchet gripper offers durability and grip. It uses a drop weight tensioning system and a 360-degree rotating turntable made with nickel chrome plated steel for easier and faster stringing. Next, we have the Gamma Progression ST II, another high-quality stringing machine with a manual type of spring tension winder with a range of 11 to 89 pounds or 5 to 40 kilograms. Like the other Gamma Stringing Machines, the Progression ST II features a 6-point Quick Mount system that allows you to fix your racquet securely so it won’t move around as you work. This machine also has a new and improved slim profile, an adjustment knob that is self-locking and hold the strings without putting too much clamping pressure, and all metal string clamps with diamond coatings for grip. Quick action swivel clamps and a 360-degree turntable rotation allows you to work swiftly with precision. The turntable brake also has a quick locking and unlocking function. The base is wide for stability and also has two tool trays to keep your tools organized and accessible. This package comes with a set of tools, three sets of free Gamma Performance string, a USRSA starting guide, and a 5-year limited warranty. Last but not the least, the Gamma 6004 Stringing machine boasts of a 6-point self-centering suspension mounting system that allows you to string your racquet in a much faster, easier, and simpler way. It also features a 360° rotating turntable with a locking brake, diamond-coated linear string grippers, a reversible handle, and a patented rotational string guide. The Cam-lock swivel clamps are Super Quick Switch Action, meaning, they can be secured easily and quickly to the turntable. Thanks to the universal string clamps, you get adequate but not too much clamping pressure for tennis and badminton racquets. It also features optimized teeth spacing to accommodate all racquet types. You can adjust the height of this machine from 36 to 48 inches as well. This product comes with a set of tools which includes pliers, a cleaning stone, starting clamp, hex wrench, pathfinder awl, bent pliers, diamond cutting pliers, and a straight awl. It also comes with 12 sets of Gamma string and a 5-year limited warranty. The best tennis stringing machine will ultimately depend on your personal needs and preferences. However, some things should stay the same: it should be durable, easy to use, accurate, stable, and fairly priced. It should also make restringing an enjoyable, simple, easy and fast activity. ​For this list, the best tennis stringing machine is hands down the Gamma X-ST Racquet Stringing Machine! It is durable, easy to use, accurate, stable, and fairly priced. While it is not the most portable and beginner friendly, it sure offers the best value for your money. Did you learn something from this article? I sure hope you did! If you have any more questions, suggestions, or clarifications, please feel free to leave a comment down below! Don’t forget to share this article with your friends and family as well.